GALLERY TARGET is pleased to announce showing Ly’s new series “INSIDE” which was release at “URBAN ART FAIR PARIS 2018” on April, 2018. This will be the first time showing this series in Tokyo. Ly has bee painting a monster named “LUV” which is a projection of her feelings. She has been creating “LUV” walking towards somewhere and wondering around the street. 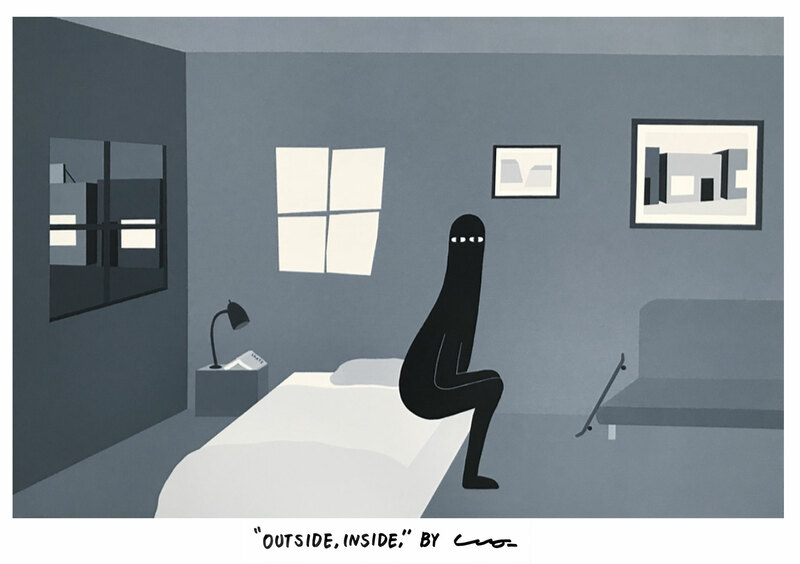 In this exhibition, Ly is going to show “LUV” in indoor, watching the street, contrast between street view painted in light toon of grays and indoor view painted in dark tones, Ly will be putting more focus on emotional side of the monster. Painter who depicts street view she visited traveling and landscape she has been imagining since youth, only in white, black and gray. In these city/landscape, LY places a monster which is a projection of her thoughts and feelings. Studied painting at an art school when she was small. At age of eleven, after witnessing a huge difference of skills her fired had, Ly started to pain her own way. In middle school, she realized that she is not equipped to apply any art school. In high school, she encounter to street art, murals and graffiti which gave her a huge influence on where she is right now. She currently is aiming to create new communication through her mural in each city.